Wonderful, Realistic Faux Grasscloth – NO Visible Seams! I love it when clients listen to my advice. This family has a home in Meyerland that was flooded in last year’s severe spring storms. While repairing the damage, they also updated the entire first floor, and they did a fabulous job with the layout and design and execution. They were originally considering grasscloth for this front entry. I told them how much I dislike grasscloth, because of the unmatched pattern, visible seams, color variations, shading, paneling, staining, bleeding, and shredding by pets. These people took my suggestion, and looked at alternatives. I love what they ended up choosing. Meaning, I positively LOVE their choice, and I hope other homeowners will use this instead of grasscloth. 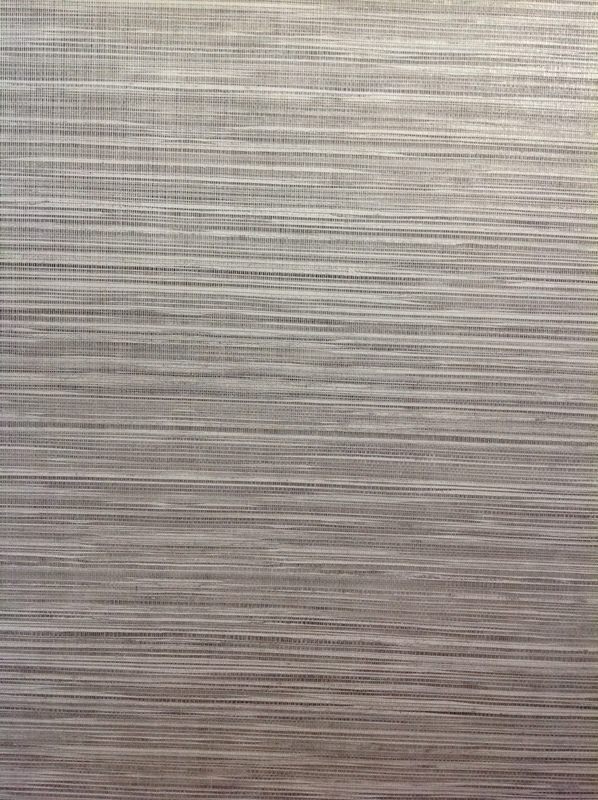 This product is a photograph of grasscloth in a paper substrate, so it looks like the real thing. It has string fibers (stringcloth) applied to the surface, which provides the texture that people love so much these days. Both the paper and the string have a coating, so the material is much more durable, and resistant to stains than real grasscloth would be. Best of all, the pattern has a match, so there are no visible seams. I mean, just TRY to find a seam in the photos above – you can’t! 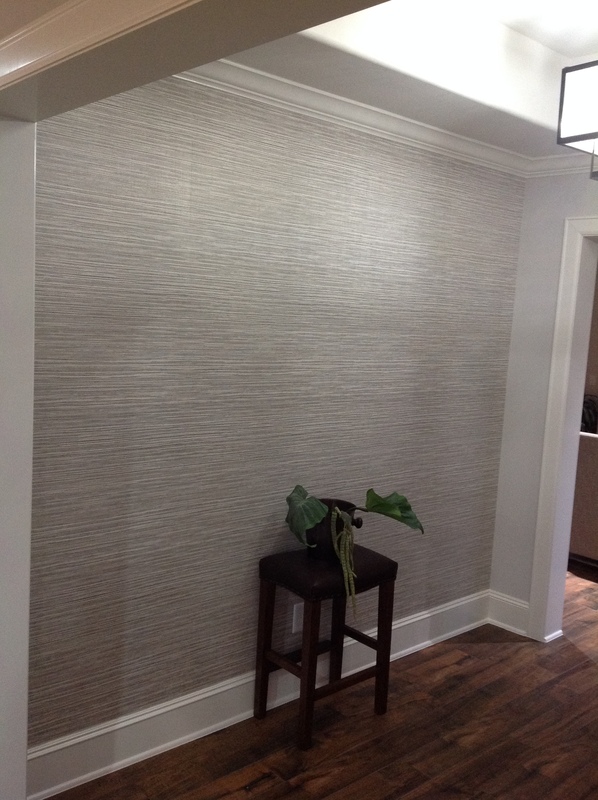 With real grasscloth, you would have a mis-matched pattern and a visible seam every 36″ across the wall. But wait- There’s more! Because this is a factory-made product, the color is consistent throughout, so that every strip, from floor to ceiling, is uniform. 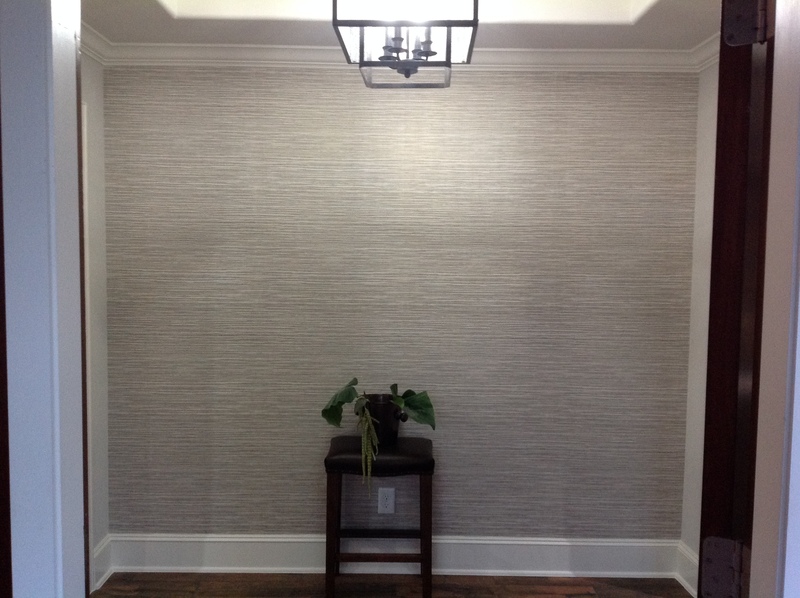 With real grasscloth, you can have noticeable differences in color from strip to strip (paneling), and even within the same strip (shading). Note: There are some darker areas in the photos above, but those are shadows, not color variations. This product is much more satisfying, and highly recommended. This wallpaper pattern is by Wallquest, in their EcoChic line, and I think the book it’s in is called Grass Effects. The pattern number is JC21020. It was bought at a below retail price from Dorota Hartwig at Southwestern Paint on Bissonnet near Kirby. (713) 520-6262 or dorotasouthwestern@hotmail.com. She is great at helping you find just the perfect wallpaper! Discuss your project and make an appointment before heading over to see her. This entry was posted on December 14, 2016 at 10:37 am and is filed under Uncategorized. You can follow any responses to this entry through the RSS 2.0 feed. You can leave a response, or trackback from your own site.